They’re back. Those pesky anxieties went away for the weekend (it was lovely) but, with the return to school brought with it anxieties aplenty for D.
Poor thing. Her first words to me this morning were “I’m worried about sports day” and that theme has continued. She wouldn’t tell me why she was worried until 7.30pm and that’s been after tears because her and T weren’t getting on as well as they could have. Her reaction when this happens is to cry and bolt, whilst for T, he likes to know exactly what’s happening and why, which D just couldn’t answer at the time. Anyway, I now know what’s troubling the lovely D. It’s not just the medals, it’s what she’ll be doing. Either she can’t remember what she’s been told or she hasn’t been told. I asked her what she’d been practising and that seemed to make everything just that little bit worse. So, a note’s going in the diary and hopefully someone will let her know. Granted it’s happening on Thursday and that’s not long to go, but when your child is anxious about the event (and getting even more so) the next couple of days could be fraught. For now, it’s cuddles, plenty of them with the hope that D’s not so anxious tomorrow after potentially being told (or re-told) the events for Sports Day. 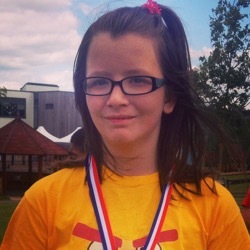 This was her last year, very proudly wearing her medal, I hope we get to see that proud little smile again this year.